Both the W510 and its optional dock feature integrated 27Wh batteries. As a result, with the dock attached you can expect a near doubling in battery life. It’s not an outright doubling because the dock itself obviously draws some power. The lock screen displays the combined charge percentage across both batteries to keep things simple. Similar to how things worked with ASUS’ Transformer series under Android, the dock is used to charge the tablet’s battery. Only once the dock’s charge is depleted will the W510’s internal battery start to drain, at which point it will power both the tablet and the dock. As is the norm with most modern tablets, the W510 introduces Acer’s own proprietary power connector. 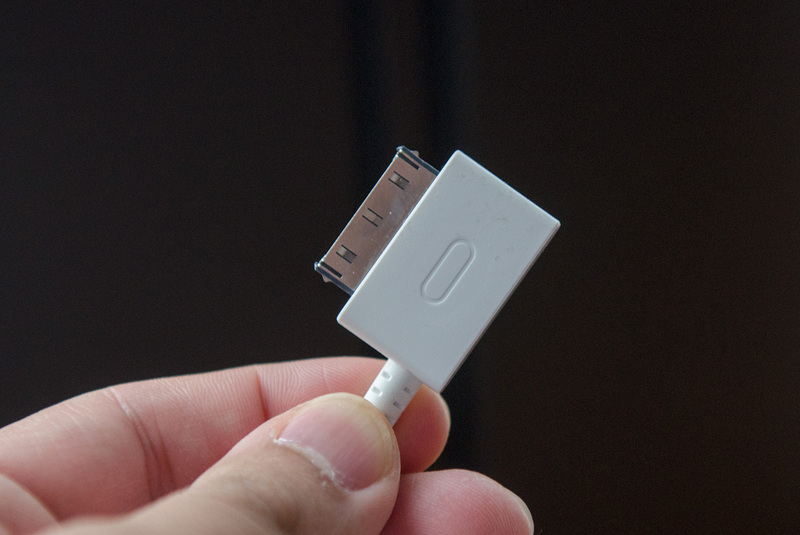 The connector itself is reminiscent of similar connectors from Apple (prior to Lightning), ASUS and Samsung. Both the tablet and the optional dock feature a power input so you can charge the system regardless of whether or not it’s docked. The same power connector is used to connect the tablet and dock so it functions for both power and data delivery. 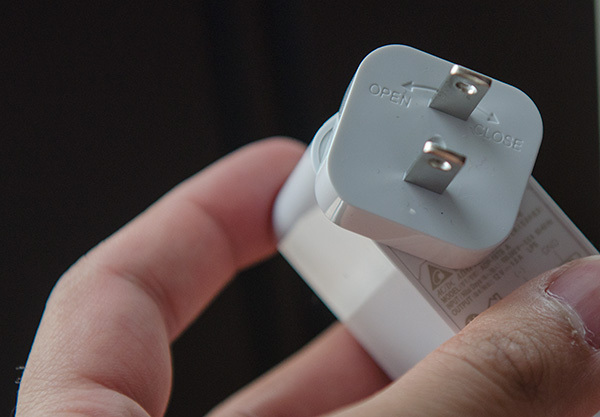 Acer bundles an 18W power adapter with the W510. The power adapter itself isn’t anything remarkable, however Acer did use a nifty removable plug that easily twists on/off. The W510 only ships with the plug for whatever region you purchased it in so I’m not sure how useful this feature is, but it’s nice to see design innovation from Acer here. 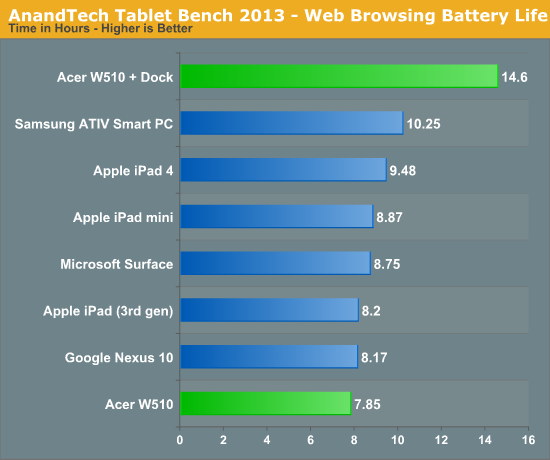 Charge time on the W510 is pretty reasonable for a 10-inch tablet. I clocked in a full charge from 0% with the tablet off at 3.632 hours. Peak power draw during the charge was 16.74W at the wall. 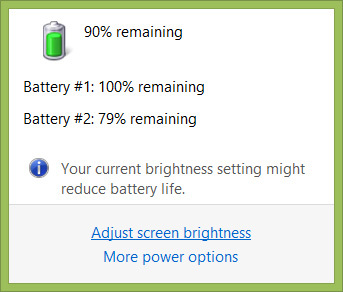 Note that this is just how long it takes to charge the W510 itself. The dock contains another 27Wh battery which should roughly double charge time. Intel’s Atom Z2760 inside the W510 is passively cooled, but under load the upper right corner of the tablet can get fairly warm. I measured a max surface temperature of 38.2C under a heavy CPU load. On the network side, we've done a lot more to prevent aggressive browser caching of our web pages. Some caching is important otherwise you end up with a baseband/WiFi test, but it's clear what we had previously wasn't working. Brian made sure that despite the increased network load, the baseband/WiFi still have the opportunity to enter their idle states during the course of the benchmark. We also increased CPU workload along two vectors: we decreased pause time between web page loads and we shifted to full desktop web pages, some of which are very js heavy. The end result is a CPU usage profile that mimics constant, heavy usage beyond just web browsing. Everything you do on your device ends up causing CPU usage peaks - opening applications, navigating around the OS and of course using apps themselves. Our 5th generation web browsing battery life test should map well to more types of mobile usage, not just idle content consumption of data from web pages. 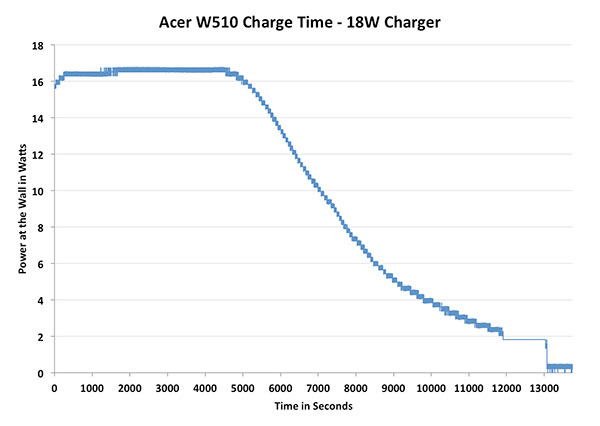 With only a 27Wh battery, the W510 delivers our shortest runtime in our new test thus far. 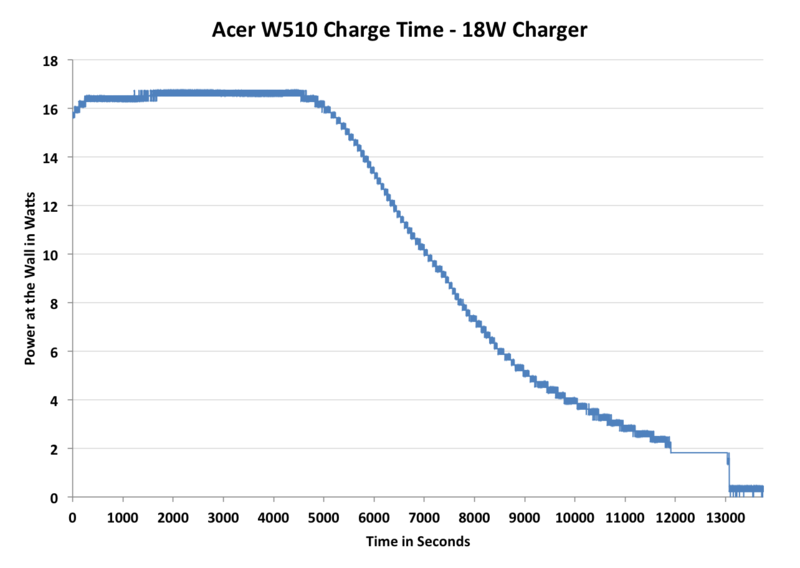 Normalizing for battery capacity however and the W510 looks quite competitive. Note the huge advantage that Samsung's Clover Trail tablet enjoys here however. I suspect there's something more than just a smaller battery holding the W510 back. Running the same test with the dock attached increases battery life by 86%. 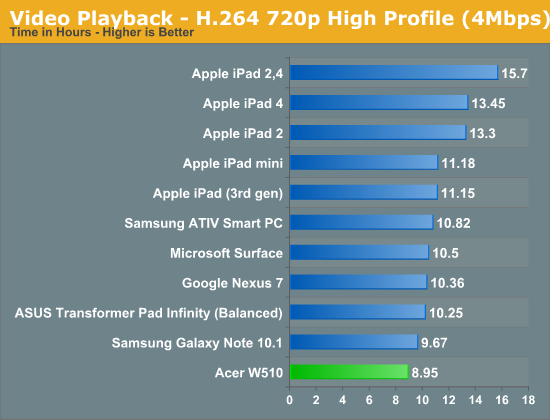 Video playback battery life is a similar story. Equipped with a fairly small battery for its screen size, the W510 weighs in at just under 9 hours of continuous playback. Samsung's 30Wh Clover Trail based ATIV Smart PC does much better by comparison. Haswell's 10W ULV chips will be priced as much as competitors' tablets. And I don't mean just the SoCs, I mean the entire tablet. Yes, but mrdude said explicitly, "it's not going to fly with the public at large." You might be willing to put down $1k late next year for the tablet PC of your dreams, but by then we'll likely be in a world of $100 7" tablets by Google. $100 vs $1k? Even RT devices will probably be $300-700. Meanwhile, Windows RT offers no benefit over Android besides a useless desktop and sync'ing at the cost of sheer multitude of apps available. It means a lot to have x86 compatible. Not everyone wants or needs to run photoshop or autocad. But Knowing that your tablet/pc can run stuff like notepad++, chrome, java and flash is A LOT to everyday regular consumer.